yep thats the way i would position the fans. check out the link i posted on how to setup the nvme ssd as a boot drive, it has the proper bios settings listed and CSM setting. yeah if you have to pull the cpu check for debris/solder in the socket pins. we had a member that had a psu rebooting trouble and he had mb socket issues. Good Idea. Will use a good whiff of dry air. I ended up pulling apart the entire thing. That new thermal paste has an interesting applicator like a mini spatula, and needless to say I over did it. So guess good thing I did (take it apart and repaste it). Didn't realize your nvme SSD link was a "how to". After I put it back together will check it out. yep if that paste oozes into the socket can cause trouble. if you use the applicator method its got to be spread ultra thin. i usually recommend 2 blobs the size of rice grains in the middle of the cpu spreader a couple millimeters apart. its almost fool proof. here is an article that explains the different methods and results. (04-16-2016, 03:31 PM)PwnBroker Wrote: yep if that paste oozes into the socket can cause trouble. if you use the applicator method its got to be spread ultra thin. i usually recommend 2 blobs the size of rice grains in the middle of the cpu spreader a couple millimeters apart. its almost fool proof. here is an article that explains the different methods and results. Thanks for the article. I think i recall the X method as being the preferred from another article i read 3 years ago. Im just not used to this new paste vs say a MX-4. Much thicker than im used to and with the kit it's essentially the spread method or figure out how drop it on without a proper tip on the tube game. Im not a fan of the spread method precisely for this reason. Just awkward. Well i cleaned both the heat sync and cpu so instead of redoing this half asleep, going to turn in for the night. Will give a hopefully positive update tomorrow. Well I managed to get rid of both the power on-off-on issue and also my boot times are are less than 19s without any "fast boot" parts enabled and keeping CSM enabled for the time being. I think I only see the windows splash screen on cold boot. NVMe drive is nice. Started from zero, updated the BIOS, CMOS reset a bunch of times to get it working. I still run through a bunch of dr. debug, but that lasts only 12 seconds. Honestly I cannot tell if this should be faster, but I currently have 1 980Ti in right now and I'm running benchmarks and tests. Win 10 navigation is just odd - have to search for control panel for example to get the overly simplified "settings" menu. I can't seem to have programs auto-update themselves - so wondering if it's UAC, the demo of BitDefender I have running or ... RAM. More testing to do as well, so will run MemTest86 overnight. Recommend any other tests for the RAM? When I do shut down, it does seem to hang on 04 and flashes 00 real quick. Honestly I don't know if that's normal or not. Now I have Dr. Debug nightmares - not knowing how long I should see these numbers. 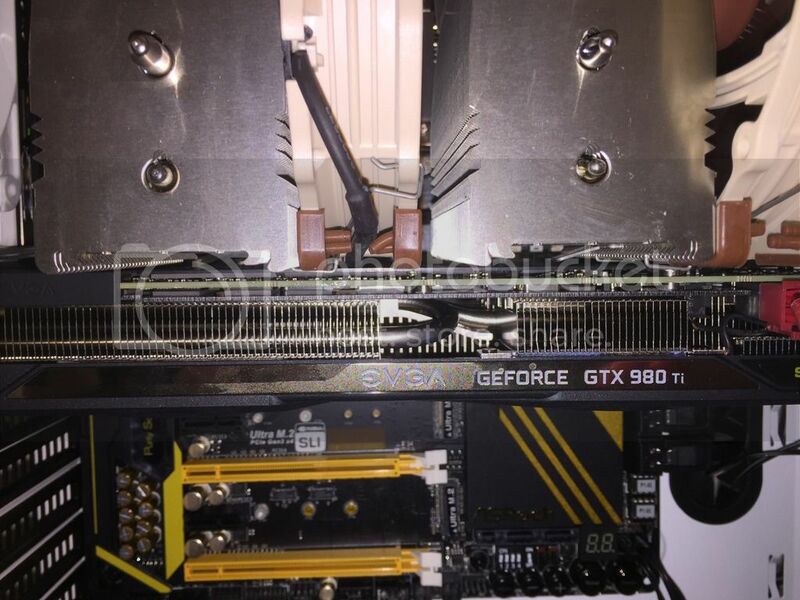 One part I wanted to get any opinions on is the fan wire from the D15 seems to be ever so slightly touching the backplate of the 980 Ti. Should I be concerned? Do I need to remove the backplate? Took a few pics of it. Running Heaven Bench (Quality: Ultra, Tess: Normal, AA - off @ 1920x1080) - GPU stays under 75C and CPU never breaks 40C (not OC'ed yet). if its just a fan wire it might not hurt, wrapping in shrink tubing where it contacts would be better if you can get to it. as long as the fans and heat sink itself arent touching anything it should be good, but if its tight against i would probably remove the backplate or the gpu when u get the second one. i wouldnt worry about the dr debug codes flashing as they will keep outputting the codes even if nothing is wrong. for getting around in win 10 here is a tip, do a search for windows+ hotkeys. print them off and use them often so they become second nature. you will never have to fumble and search for screens ever again in any version of windows. (04-17-2016, 04:23 PM)PwnBroker Wrote: if its just a fan wire it might not hurt, wrapping in shrink tubing where it contacts would be better if you can get to it. 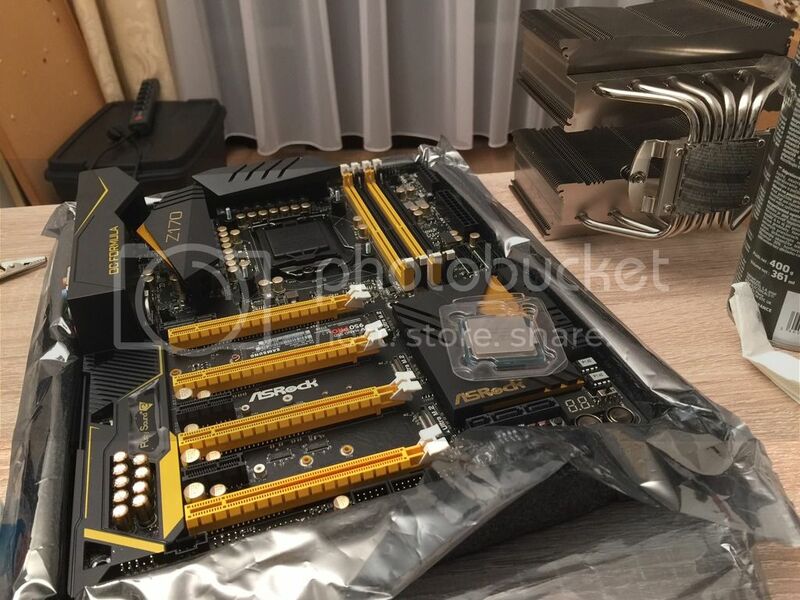 as long as the fans and heat sink itself arent touching anything it should be good, but if its tight against i would probably remove the backplate or the gpu when u get the second one. i wouldnt worry about the dr debug codes flashing as they will keep outputting the codes even if nothing is wrong. I think the fan wire has shrink tubing already on it with a protective sleeve on top of it, but I think now that you mention it I'm not 100% confident that it's not touching everywhere. It's tight all around. 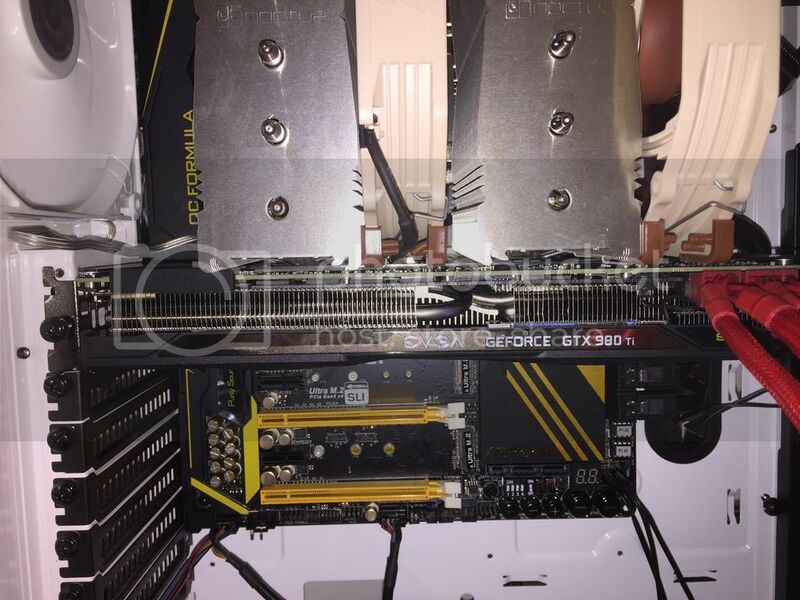 So I think I'll move it to the 2nd slot (3rd) in this case or remove the backplate altogether (although not like the 2nd card in SLI ever overheats). Not sure how it contributed to the cooling, so will test the other one's temps in slot 1 when back from work. (04-17-2016, 04:23 PM)PwnBroker Wrote: for getting around in win 10 here is a tip, do a search for windows+ hotkeys. print them off and use them often so they become second nature. you will never have to fumble and search for screens ever again in any version of windows. You know it's funny how before I never felt the need, but in this case it is quite annoying not finding things where I expect them to be - so your idea is great. Will absolutely do that and not be a slave to UI designers for the "masses" anymore! P.S. What do you guys think of "stressapptest" from Google? I saw a post from Asus ROG that they said it was their preferred memory test, but was thinking if I use it would use an alternate SSD/HDD instead of my NVMe drive to not wear out its lifetime - in addition to the fact I need to install a temporary Linux build. Thoughts?